You are going to be so happy that you checked in with me today, gentle reader. So happy. Breads aplenty acooling . . .
Much as I absolutely love homemade bread, here’s my guilty secret: I’m not one of those mamas who makes bread every day. I know many of these wonderful ladies. I would love to be one of these wonderful ladies. My children, even more so, would rise up and call me “Blessed” if I became one of these wonderful ladies. Sigh. But no. My children do get enough homemade bread to turn up their noses at store bread (“air bread” is what they call it) but they will eat it, if pressed. Some days are just too doggone busy, with school and errands and music lessons and admiring my newly-sprouted (yes!) 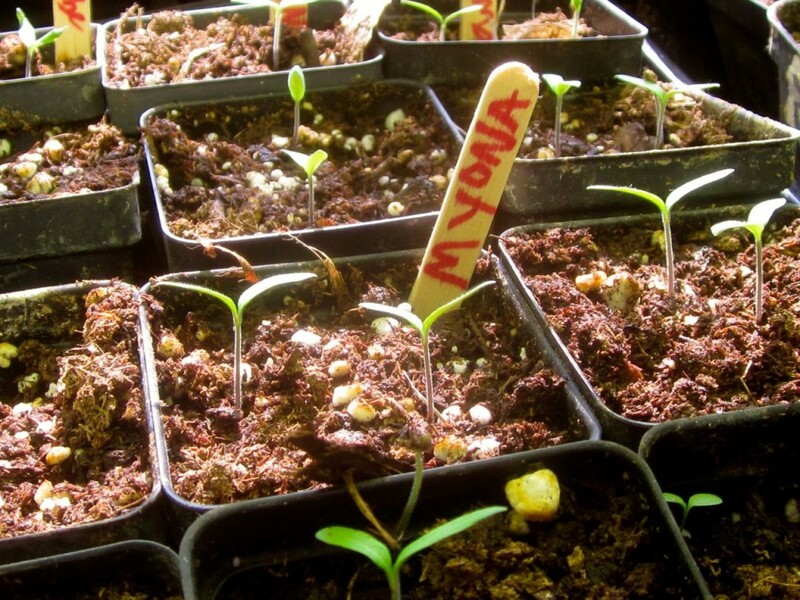 heirloom tomato seedlings (yes!) to mix up another batch of bread which, truth is, will mostly be eaten within an hour (no lie) squished out of shape (that’s why you don’t slice hot bread straight out of the oven, I remind them, but nobody listens) and spread thickly with butter. And possibly drizzled lightly with honey. Did I mention that my oven just stopped working yesterday? It’s true. It was a dramatic experience and, I suspect, a bit dangerous. If pressed, I will tell you the story. But that’s beside the point. Which is: baby tomatoes! Gosh, I think I need to make some bread. Suddenly I’m very, very hungry for a slice. With just a skiff of butter and a drizzle of honey . . . ? There is just nothing like the smell of homemade bread to make a home welcoming and warm, and just a nice place to be. Don’t you agree? But I just wanted to get that out of the way: I don’t make bread every day. I’ve always felt like in A Perfect World, I’d have time to make bread every day. Someday, when my super-secret cloning experiments prove to be a success, I will instruct my willing clone (who doesn’t argue or roll her eyes, ever) to make bread every day. Deal, kids? But. 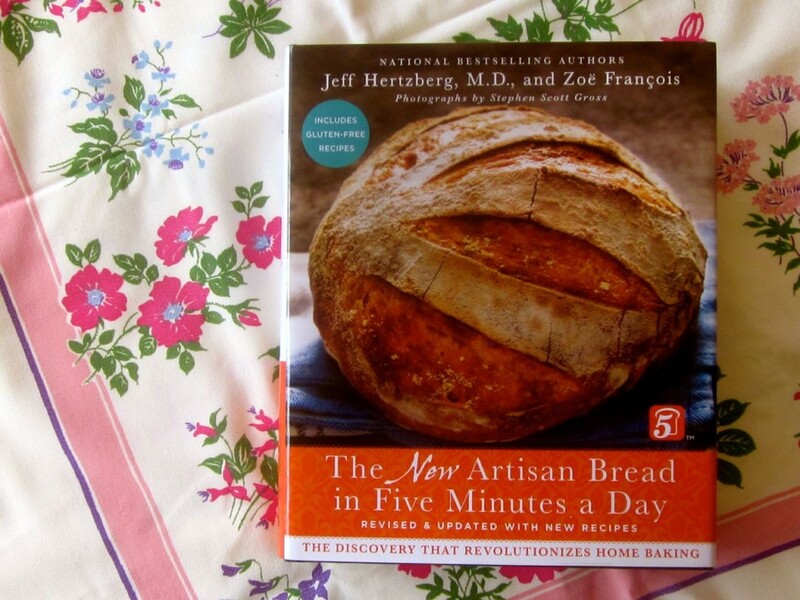 When I discovered the Artisan Bread in 5 Minutes a Day cookbook a couple of years ago, I got closer to that ideal of making bread every day. This makes my family so, so happy. It makes me happy, too. This method of making a very wet dough, and storing it for up to a few hours to a few weeks in the refrigerator, and then quickly shaping loaves and baking them in a very hot, steamy oven, is so easy and convenient. It takes (literally) less than 5 minutes to mix up a batch of dough, and then later, less than 5 minutes (literally) to shape the chilled dough into loaves. And it comes out looking like this: crusty, chewy, hearty, lovely. 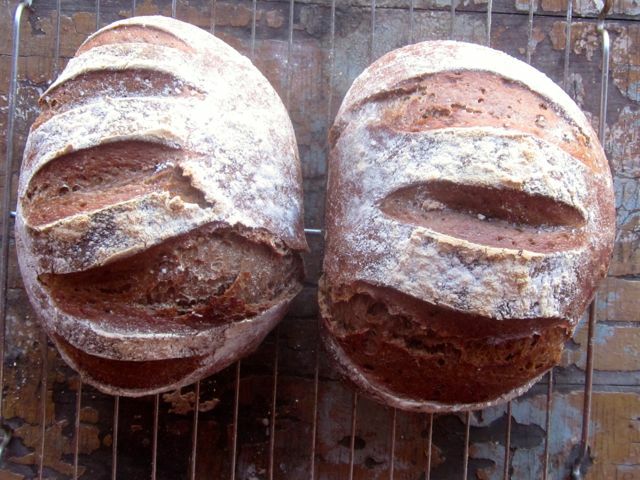 On of my Artisan in 5 Minutes a Day recipes: Mocha-Honey Rye bread. Yum. Can you picture it? . . . here’s my typical bread-making routine: I mix up 4 or 5 or 6 buckets of dough on the weekend. It takes me, roughly, 15 minutes. I sock them all away, feeling very smart indeed, in the refrigerator (we have an extra ‘fridge in the basement). Of course you can do this on a smaller scale, putting just one or two buckets into your ‘fridge, if you don’t have that extra ‘fridge space available. It’s all good. I realize that not everybody has 32 people that they are feeding on a daily basis. Or is it 64? Or 108? So hard to remember, and it varies from day to day. Lots. This dough is very versatile. What will you do with it? Perhaps you decide on honey cinnamon rolls for breakfast on Monday morning (my family needs something special on Monday mornings, doesn’t yours? ), and then on Tuesday let’s say you’re making a quick spaghetti for dinner, so you shape some cheese bread to go with it, which rises as you make the rest of your dinner. 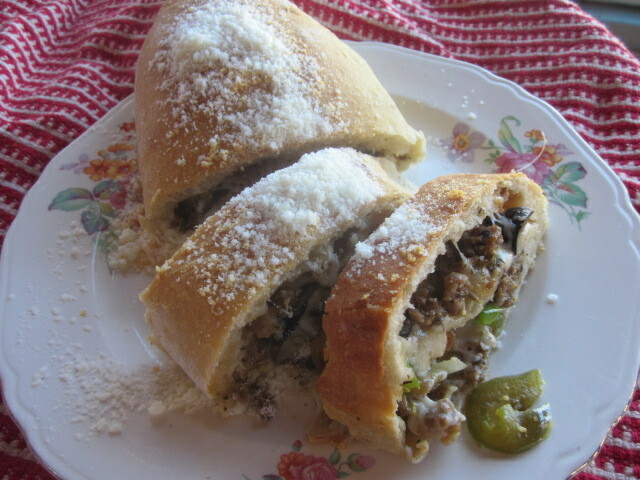 On Wednesday, it’s 5:00 before you know it, and you need to make something really quick for dinner so you make some “Crunch time” Stromboli and a big green salad and call it good. Everybody else calls it good, too. It smells so good while it’s baking! OH this is so easy and so GOOD! On Thursday, you’ve got just a bit of time before you’ve got to run your little boy to Taekwondo (gosh that sounds familiar) so you shape some buns really quickly before you leave (you can do this, because this dough isn’t fussy about rising times: an hour is fine, an hour and a half won’t bother them a bit) and you plan to fry hamburgers to go in them, while they bake, when you get home. And on Friday, of course everybody wants pizza for dinner, it’s FRIDAY after all. It’s pizza night! You’re tired (it’s FRIDAY after all) and initially you think, Oiy, homemade pizza, but then! You remember that last bucket of dough and you (smugly) pull it out, and start rolling it out into pizza crusts. Your family, after all, rises up and calls you Blessed. You blush and feel just a bit guilty, because it wasn’t at all difficult to work fresh bread into every day’s meals. Because of that stash of bucket dough in the ‘fridge. (Thank you again, Zoë and Jeff.) And tomorrow–you’ll take 15 minutes to whip up another weeks’ worth. Can you picture it? So using the Artisan Bread in 5 Minutes a Day method of making dough is a great boon to you if you’re the one who is responsible for making the meals at your house. But it’s also very handy if you make bread for a crowd. When I carried the same “bucket dough” method to my farmer’s market table, everybody was happy there, too. Truth is, making traditional homemade bread, with its required rising and re-shaping, kneading and tossing about, was really taking a toll on my hands and wrists. I’m no spring chicken, you know. But. 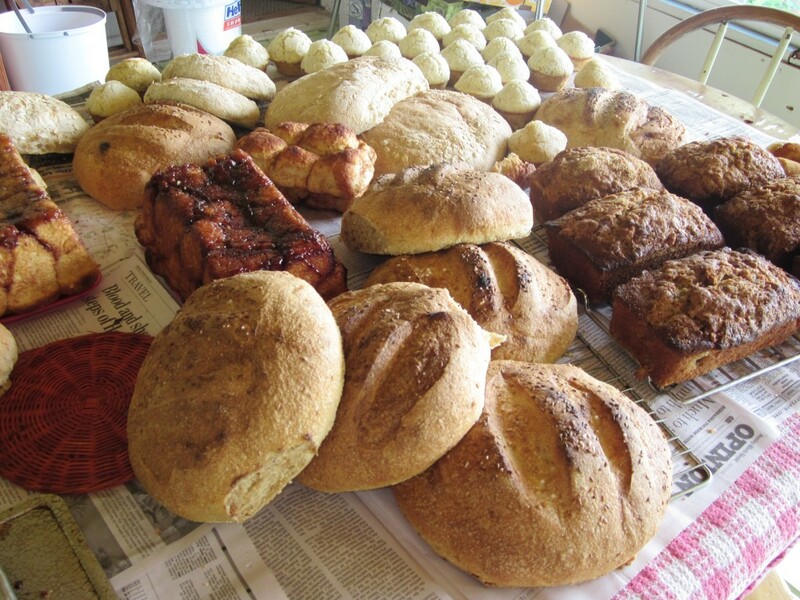 Then my sister Mollie suggested that I try Artisan Bread in 5 Minutes a Day for some of my farmer’s markets breads. First, I checked the book out of the library. Then I bought it. My copy now, after several years’ use, is well-worn, full of post-it notes and written notes and bookmarks. I’ve just used it and loved it to death. Here’s my old edition, with lots of notes written inside, post-it notes and bookmarks. 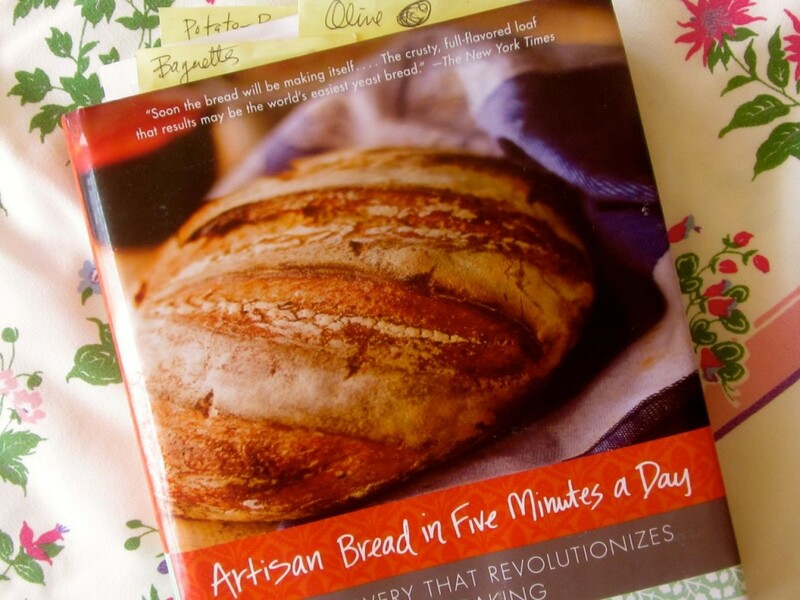 My sister Mollie blew my mind away again a couple of months ago and shared with me that Jeff and Zoë, the authors of the original Artisan Bread in 5, had written a new and revised book, much bigger and even better than the original. I didn’t wait for the library to get it this time. I bought a copy right away. Good thing my sister Mollie keeps me in the loop about such things. I do tend to live under a rock. This new book has gobs of brand new recipes, lots of gorgeous new photos, revisions on some of the recipes that I’ve used hundreds of times, and lots more! I just love it! Here’s the new edition! (Happy dance) Isn’t it beautiful? You ought to check out Jeff and Zoe’s website. 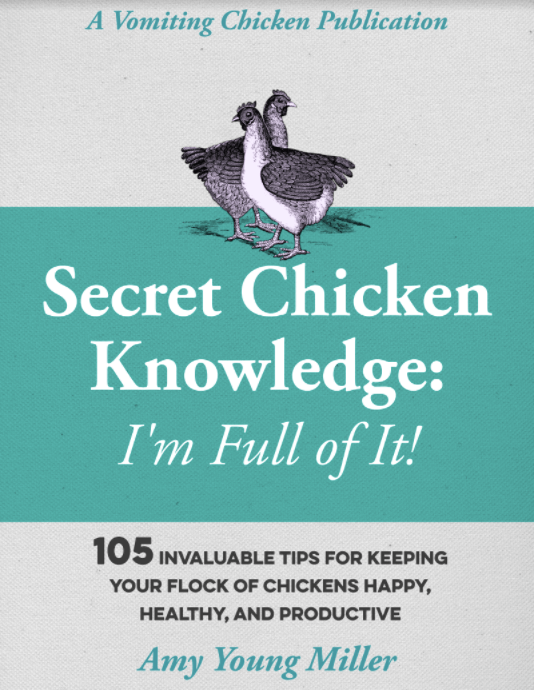 It’s always packed with new recipes that aren’t in the books, question and answer sessions, very helpful tutorials, and much more. Want a copy of this excellent book right away? I don’t blame you–click here to get your own copy! ← End of the Hoop House Season Soup, tra-laaa! We love homemade bread, especially 5 minute artisan bread! Thanks Amy! looks good Amy. My great grandmother considered it an insult to sit her family down to a meal with cold bread, so she made hot , fresh bread 3 times a day — on a wood fired stove. What a woman! I can’t decide if that’s an inspiring story, Dad, or an exhausting one. She had mad kitchen skills, I’m sure of it! I also love to eat it fresh out of the oven. It just smells so darn good! Squished is good, right? Oh, okay, squished tastes just as good–it’s just not as pretty! I love homemade bread but with just two of us home now and arthritis taking its toll on my wrists and fingers, I make it rarely. This looks like the solution. Thanks, Amy. Yup. That’s one reason I like it so well, too, Fran–no kneading! I need that book. I bake bread a lot, and I’m always finding ways to recreate it at home. Thanks for posting! You can make lots more bread, in less time, with this bucket dough method! It’s great! Nothing will make you feel quite as as home made bread!! I’ve gone through a couple of periods of using this method of making bread. I have the book too. 🙂 It’s something I should do again. It really is a good and easy method. I need some room in the fridge. Rita, what are you waiting for? Have you got those pants finished yet? You may need some hot bread to get the job finished, eh? Do you just fill out the entries that you’re qualified to earn? There isn’t an ‘ok, do it’ button. Did you figure out how to do it, Rita? That bread looks amazing! Thanks for the opportunity to win the cookbook. You are welcome, Annette, and don’t forget that you can enter again and again. Haven’t made bread for ages but there nothing like fresh bread from the oven with little some butter and honey. We haven’t started our seeds yet. My guilty secret is, I used to bake a lot of bread in college. I showed my boyfriend (now my husband of almost 40 years) how, then he took over, and I have not baked bread in over 30 years now. Even he stopped. We need to get back to some good bread baking. I hope to win this. My husband’s birthday is coming up…. Oh yes, the best way to eat homemade bread. Fresh out of the oven, rip off a piece, apply genuine butter, eat, repeat. yummmm I so agree Alana! Me too Sophie! The rustic-er (is that a word?) the better! Well this is a great and inspiring blog post. My husband has been making baguettes with this method from an article he read in Mother Earth News 5 years ago by the same author. He makes about 25 loaves and we drive out and deliver warm bread to everyone in our rural community. I love how everyone arranges their evening meal around his warm bread and the variety of smells that come from all these kitchens is wonderful. Then we come home and make homemade pizzas. I hope I win this but whether I do or not, this book will soon be on my shelf. Warm and with lots of salted butter. I recently bought einkorn from Jovial and have been experimenting with it and sourdough. Bread fresh out of the oven with a little butter, please! Thanks for the chance! The best way to eat it is to slice off the end as soon as you dare when it comes out of the oven, slather it with butter, and top it off with homemade blackberry jam. That said, could you use sourdough starter to make this kind of bread? Yes you can use sourdough starter to make this, at least I’m assuming so. Try it and let me know! Also, if you let the buckets of dough sit in the ‘fridge for a week or two, it will take on a rather sour taste, not unlike sourdough. I just requested this book from the library! It’s a wonderful book, Rachel! My favorite way to eat bread is hot right out of the oven with soft butter spread over it. I never had much patience for letting it cool so it cut easier. I have a husband who wants warm crusty bread with dinner every night so of course my 4 kids grew up loving it too. Luckily I loved making it but due to fibromyalgia , carpal tunnel syndrome etc I just don’t do it much anymore ( as my youngest son constantly reminds me). This might be a way to have homemade breads & pizza again. Thanks for a great giveaway. Yep, this dough takes NO kneading. One reason I love it so much! 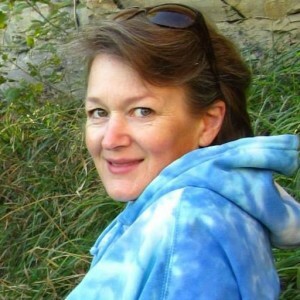 Good luck, Kathy, and remember that you can put in new entries every day, to increase your chances to win it! I have heard about this book and wanted to try it. Your descriptions sound wonderful and inspiring! SO enjoy your blog! Loryjean, how sweet of you to say so. Thank you! And if you’d share it with your friends, I would be so grateful! My favorite way to eat bread is to use it to make Cashew French Toast, though I usually just toast my bread. I’ve been wanting more variety, but it has always seemed like too much work when baking for only one person and having just a ‘fridge-top freezer to store excess until it is needed. This book could make it so much easier to get some variety. I love your suggestions! And if you’re cooking for just one most of the time, you can pull out just enough dough for one load at a time. Easy! A totally awesome posting! And great photography! The best way to eat homemade bread is warm with butter. There you’ve gone and done it again. I always though that you made bread daily and that is one of the reasons I held you so high as an example of the ideal plans women, Chickens to feed, organic vegetables to raise, children to raise and school plus daily home made bread. What next, are you going to tell me that you sometimes purchase some chicken for dinner “in a pinch”? oh it hurts when a heron starts to crumble in front of your eyes. Hehee, Chef, you made me laugh. You’re confusing me with Ma from the Little House Books, methinks . . . Agreed, Tina! Of COURSE there will be butter and hot bread in heaven! We have just started making homemade bread the last couple of months. No one wants store bought any more. I will have to look up this book. Thanks. Hi, Amy! I adore your writing! My mom and I make bread for the local farmers market (the old way). Soo time consuming but so worth the effort on a small scale. This book sounds really awesome-quality and quantity! Shelly, Maybe you should try it? Where do you sell at market? My favorite way to eat bread. . . hot, right out of the oven, slathered with butter and our honey. 🙂 Mmm. Amalia, you must be related to ME! I love love love fresh bread with butter! and avocado with some salt and pepper! Oh wow, avocado, that sounds delish! We sell in Chester Arkansas, tiny town, tiny farmers market! I have seen the book on Amazon and have wanted it- just not been able to purchase. I was in cooking school at the local community college and loved the baking classes the most. I hope you win, Shelly! Homemade bread is always better and can be enjoyed in any way that commercially-baked white bread is. Thanks for the opportunity. Agreed! Thank you for your comment! 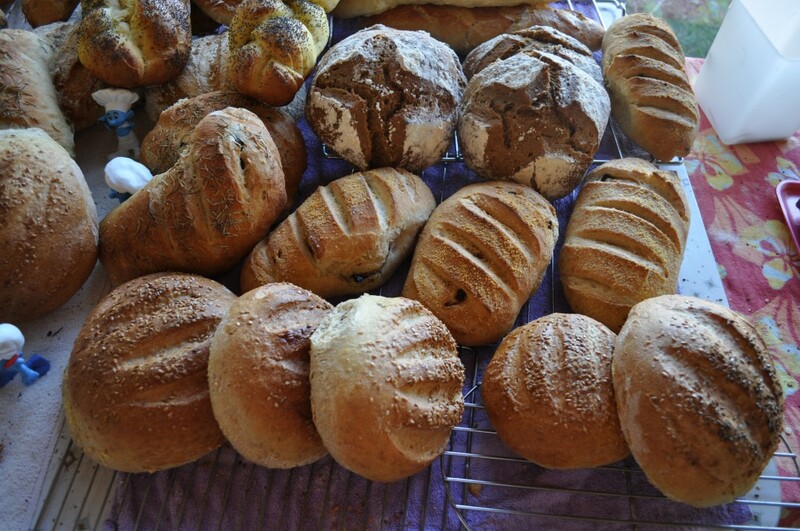 I am a bread lover – best types are the crunchy top types. Toast is my favorite way to eat bread. Hot and fresh with homemade butter! This dough is very forgiving, and not at all fussy about the temperature of the liquid, as long as it’s not scalding hot! In my experience (cooking school student and daughter of an excellent bread baker) perhaps I can offer some tidbits of advice? As dramamamafive says when fermenting the yeast don’t get the liquid too hot. Lukewarm is best -no hotter than 110 degrees. If you don’t have a thermometer the liquid will be pleasantly warm but not hot. Too cool the yeast takes longer. Hotter kills the yeast. Temperature in the house is a factor but if the house is cool a pan of steaming water nearby the bread making process will help. Thanks Shelly, those are great tips! What a wonderful book. I can almost smell the fresh baking bread now! First I’d like to thank you. I so enjoy reading your blog. It is endearing, entertaining, and I learn a lot too! I’m super excited to hear about a new version of this book as I have the original and love it. It would be lovely to win a copy, but if I don’t I’m sure I will have to buy one! thank you again for sharing your light. Veronica, I must thank you for reading! Thanks for being one of my faithful Gentle Readers. I appreciate you, and I appreciate your kind words. They made my day! 🙂 <-----me! oops, didn’t realize I had to say my favorite way to enjoy homemade bread! but there are so many ways! I don’t have a favorite, it depends on my mood. I love it with butter (of course) or even with a nice thick layer of mayonnaise. I also like to smear it with Nutella. A new way is to toast it slightly then spread with peanut butter and homemade Calamondin marmalade. You’re very creative with your choices, Veronica. Yum. I LOVE Nutella. In great big spoonfuls, AND on fresh bread. Yum! And homemade Calamondin marmalade–that sounds wonderful! What is it? Thank you Anita-Clare. I’d love to hear more about flowerpot baking! Will you write about it? Like you, warm and out of the oven! Mmmmm….